With only on month until Father’s day it is time to get your creative thinking cap on for the perfect gift for Dad. Men are not the easiest people to shop for… which makes it hard. I find the hard thing about Father’s day gifts is how expensive gifts for men tend to be. 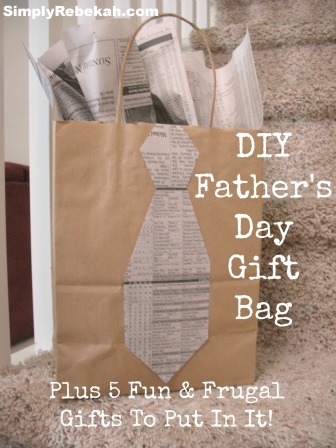 If you’re on a budget for Dad, check out this post. Found over at Simply Rebekah, she has this adorable gift bag as well as some get budget friendly gift to stuff that bag full. You could easily do a few of the gifts and still keep on budget.